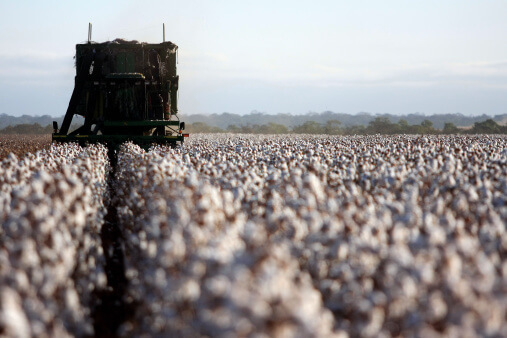 Most people are surprised to find cotton on a list of key food products for change. After all, less than 2.5% of the world’s agricultural cropland is devoted to it. Nevertheless, according to some studies, cotton accounts for 10% of all pesticide use, 25% of all insecticide use, and more total insecticide use than any other crop34. And those used are among the most toxic. The World Health Organization estimates there are 25 million global poisonings and 20,000 deaths from all pesticides each year35, not to mention the enormous damage to wildlife. Cotton is a major contributor. But it isn’t a food! Or is it? Without consumers being conscious of it, much of it ends up in our food. According to the National Cotton Council, about 2/3 of the national crop is harvested as cottonseeds36. The oil from the seeds is used in our food supply, appearing in vegetable oil (cottonseed oil), salad dressings, peanut butter, and snack foods such as crackers, cookies, chips, and pretzels. The meal from the seeds has primarily been fed to dairy cows (back to item #1) 37, but is increasingly being used as a protein source for people38. Of the more than 14 million acres of cotton fields in the US, fewer than 10,000 acres are organic – less than seven hundredths of one percent of our entire crop39. By contrast, over 10 million acres are planted with genetically modified (GM) cotton40. It’s one of the top 3 GM crops in the U.S. The USDA, in its report on the first decade of GM foods, observes that in the U.S. most consumers have concerns about GM foods but routinely eat them “largely unaware” that they are doing so. This contrasts starkly with the European Union and Japan where consumer preference has largely eliminated GM ingredients from store shelves41. If a product lists cottonseed oil or an unidentified vegetable oil on the label – choose an organic brand instead. And wear your organic cotton. It’s a safe choice for you and far healthier for the planet. This one is tough, but together we can target what is perhaps the single most important crop to change. 34Pesticide Action Network of North America. Problems with Conventional Cot… Production. 35Ahmad K. United Nations calls for tighter control on pesticide use in poor nations. The Lancet, Volume 360, Issue 9345, Pages 1574-1574. 36National Cotton Council. Frequently Asked Questions. October 2002. 37USDA Economic Research Service. Cotton Briefing Room, http://www.ers.usda.gov/Briefing/Cotton accessed Feb 5, 2007. 38Cotton Incorporated. Cotton Clothes and Feeds the World. Press release, November 22, 2006. 40Fernandez-Cornejo, J. “Adoption of Genetically Engineered Crops in theU.S.” Data product. U.S. Department of Agriculture, Economic ResearchService. http://www.ers.usda.gov/Data/BiotechCrops/ . Accessed July 2005. 41Fernandez-Cornejo J and Caswell M. The First Decade of Genetically Engineered Crops in the United States. USDA Economic Information Bulletin Number 11. April 2006.